A beautiful Flowerpot Coral is a tribute to the expert aquarist that can successfully keep it! The Flowerpot Coral Goniopora stokesi has a very attractive and distinct appearance. They are hemispherical or grow in short thick columns. 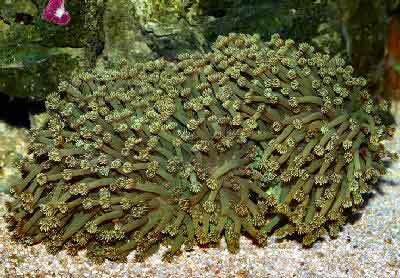 Their stalks are topped with a fringe of 24 polyps of mixed sizes surrounding the center, or mouth area. They look much like a cluster of potted flowers. The colors the Flowerpot Corals come in are generally green or brown, and at times have lighter polyp tips. The G. stokesi extend their polyps during the day, yet are partially retracted at night. An interesting fact is that their nervous system is very intricate. If you touch one side of these corals, it sends impulses to the rest of the coral, and the other parts will pull in their tentacles! Currently the G. stokesi is the only free living Goniopora species, meaning it is not attached to the reef. They are found on soft substrates in calm waters. The green Flowerpot Coral G. stokesi, along with the brown G. lobata are the most common Goniopora species found in aquaria. A newer Red Goniopora G. somaliensis has become popular due the fact that it is one of the hardiest Goniopora species. Some other common names they are known by are Daisy Coral, Ball Coral, Green Flowerpot Coral, Red Flowerpot Coral, Sunflower Coral, Goniopora Coral, Goni, Yoo-Hoo Coral, and Yoo Stone Coral. The Goniopora species are a challenge to care for in captivity. This type of coral is not recommended for beginner aquarium keepers. Many find them don't survive for more than a year, though some experienced aquarists have been successful at keeping them for three years or more. The loss of these corals usually occurs slowly, as sort of a wasting condition. The G. stokesi (Green Flowerpot Coral) can fair better than many, and even be propagated under the right conditions. They need a moderate water flow, water changes, carbonate supplementation, and calcium. They also need to be monitored frequently and kept consistent. A sandy substrate and planted sea grass in the tank has been noted as helpful, possibly from a nutritional standpoint. Distribution / Background Goniopora Coral Information: The Goniopora genus was described by de Blainville in 1830. The Flowerpot Coral Goniopora stokesi was described by Edwards and Haime in 1851. Other names this coral is known for are Daisy Coral, Green Flowerpot Coral, Sunflower Coral, Goni, and Yoo-Hoo Coral. Where Goniopora Corals Are Found: The Goniopora genus spans across the Indian Ocean and most of the Pacific Ocean's tropical waters including the Red Sea and the East, West and North Coasts of Australia. G. stokesi are found from the eastern Africa across to the the Philippines, Indonesia, and Australia. Around Australia in the Great Barrier Reef, Coral Sea, and Houtman Abrolhos Islands on the west coast. Status The G. stokesi is on the IUCN Red List of Endangered Species as Near Threatened (NT). Description What do Goniopora Corals look like: The Flowerpot Coral G. stokesi is, at this point, the only free living Goniopora that is not attached to the reef. They are found on soft substrate in calm waters. They are hemispherical or grow in short thick columns with mixed polyp sizes and are generally green or brown, at times with lighter tips to the polyp tips. Goniopora corals have 24 tentacle tips and their corallites have 24 septa. The tentacles can reach up to 12 inches (30 cm) or more. The polyps extend during the day, yet are partially retracted at night. Their appearance is similar to their close relatives the Branching Flowerpot Coral Alveopora sp., yet the Alveopora have only 12 polyps each. The polyps of Goniopora corals are also larger than Alveopora corals. Life span is unknown. Difficulty of Care Goniopora Coral Care: The Goniopora corals are very difficult to care for. There is a push to try and figure out the right "combination" of light, current, supplements and food needs for this coral due to its dismal record in captivity. It is near impossible to know the exact location from which your Goniopora was extracted, though that will give a clue as to that specific animal's specific needs. This type of coral is not recommended for beginner aquarium keepers. G. stokesi (Green Flowerpot Coral) can fair better than other species, and even be propagated under the right conditions. They can handle more light than G. lobata, in fact a photo time of 6-8 hours of 400 Watt 20k German brand Metal Halides was suggested by one aquarist. This has to be done with caution as they can bleach out if it is too much light. The Flower Pot Coral needs a moderate water flow, water changes, carbonate supplementation, and calcium. They also need to be monitored frequently and kept consistent. A sandy substrate and plant sea grass in the tank has been noted as helpful, possibly from a nutritional standpoint. Stir up the detritus from your sand bed, since this seems to be another source of nutrition for them. Aquarium Parameters A well-feed live rock/reef environment with a sandy substrate is what is needed for your Flowerpot Coral, along with some fish for organic matter production. A mature tank is recommended. It has been suggested that tanks without protein skimmers, that do not take out suspended matter or plankton, may be a clue to helping with the Goniopora's survival. Algae turf scrubbers also seem to be a benefit due to the increased micro fauna that results from this type of environment. Be sure to have proper water movement and lighting. Provide a moderate to high lighting and a moderate water flow for the best health of the G. stokesi. Plant sea grass in the tank, as it has been noted as helpful, possibly from a nutritional standpoint. Make sure they are anchored down well. Falls can also cause injury to the skeleton, and eventually death as well. This is an aggressive species, and should not be kept in a mixed reef. Compatibility and Social Behaviors Goniopora corals should not be kept in a mixed reef garden. They are aggressive and will sting nearby corals. It is not wise to have more than one species of Goniopora in the same tank since that species will release a bio-active chemical that is toxic to other species of Goniopora. The Goniopora may, depending on the specimen, may accept clown fish. Or on the other hand, they can slowly recede and die from the constant irritation of a clown fish. Potential Problems The G. stokesi is susceptible to brown jelly or protozoan infections, bleaching, and high water flow. Availability Goniopora Corals for Sale: Goniopora species, including the Flowerpot Coral G. stokesi are very easy to find at pet shops and on line. Online they can run about $60.00 to $80.00 USD or more depending on size and/or color. Yes, I will agree with that detail mentioned. I learn and also watch for water changes from them too. A good companion of mine in the Tank. Flower pots is my favourite.